“AIRCRAFT CARRIER” By J. Bryan, III. Commissioned before World War II in 1937, the USS Yorktown (CV-5) was sunk June 7, 1942 at the Battle for Midway. This is an exceptional minute-by-minute diary of the action aboard the carrier at Midway. Author Bryan tells the amazing story of men facing danger daily. It’s all here––the jokes to deal with dear, the superstitions, the intense interdependence, the excited pilots returning from successful strikes, the blasting of daily life by enemy attacks. Bryan, a well-known journalist, served as a Lieutenant Commander on the Yorktown. The story he tells is one of the most amazing accounts of young men in World War II. 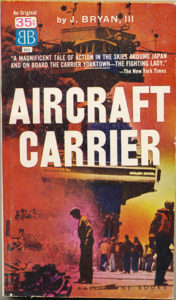 First published in 1954, this is a 1962 Paperback edition. 182 pages, no photos, maps or index.